In October 2018, former World Bank president Jim Yong Kim announced the appointment of Alison Evans as Director General of the World Bank’s Independent Evaluation Group (IEG), effective 3 January. Before joining the Bank, Evans was Chief Commissioner of the UK’s Independent Commission for Aid Impact and prior to that was Executive Director of the UK-based Overseas Development Institute. She also has six years of experience working at the World Bank as a Senior Economist. 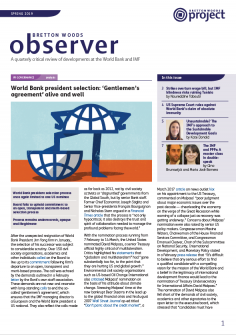 Civil society will be looking at whether Evans will ensure that the IEG evaluates contentious issues, such as the Bank’s Maximizing Finance for Development paradigm, which leverages private sector investments in development projects (see Observer Summer 2017). In December 2018, Ramanie Kunanayagam joined the World Bank as a member of the Inspection Panel (IPN), the Bank’s independent accountability mechanism, succeeding Gonzalo Castro de la Mata. Kunanayagam has more than 25 years of experience across diverse environments in private, public and non-profit sectors. She was also appointed as social specialist secondee to the World Bank early in her career. In addition, Kunanayagam is a Board member of two non-profit development organizations – RESOLVE and Youth Business International. As part of the ongoing IPN review process, civil society has called on the Bank to ensure that the Panel is given an independent monitoring function, and that the Board considers the establishment of independent, community-led monitoring arrangements (see Observer Winter 2018).